“This award means that the door has been opened. For not only diversity in Hollywood but also for the fashion industry at large. And I am proud to break this ground,” says Carter. 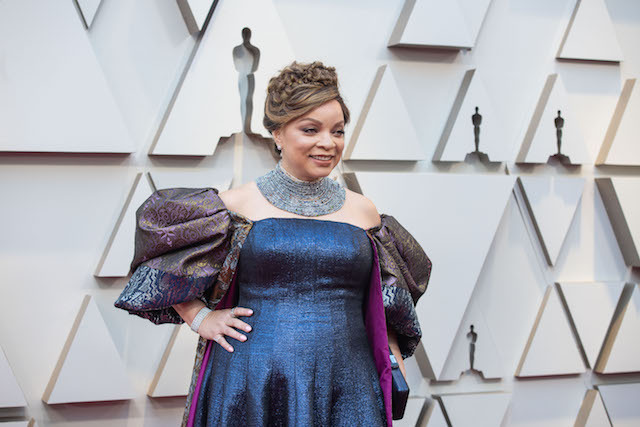 The Black Design Collective (BDC) will pay tribute to Academy Award-winning Costume Designer Ruth E. Carter, at their inaugural Scholarship celebration on Saturday, April 13th at the FIDM Museum in Downtown Los Angeles. Fashion designers Angela Dean, Kevan Hall and TJ Walker are the organizers behind the Los Angeles based Black Design Collective which was created to support black fashion designers and costume designers. The organization also has a scholarship fund established to help young designers in their pursuit of higher education in the field of fashion, design and costume design. Carter, a costume designer who has worked with Spike Lee on over ten films together beginning with “School Daze,” “Do the Right Thing,” “Malcolm X” and “Old Boy” received an Oscar at this year’s Academy Awards for her work on “Black Panther,” and her iconic costumes worn by Angela Bassett, “Ramonda,” Forest Whitaker, “Zuri,” and Danai Gurria are currently on display in the FIDM Museum as part of their annual Art of Motion Picture Costume Design Exhibition, now thru April 13th. The evening will also recognize emerging talent as BDC will present their first talented costume design student with a merit scholarship. The award will be selected by the founding members and based on the following criteria: Overall portfolio presentation; volunteer & community involvement; an average GPA of 3.5 and key references from instructors. The participant must also submit a 250-word essay on their individual career goals and continuing changes they would like to see in the world of fashion. The event will take place on the Los Angeles campus of the Fashion Institute of Design & Merchandising located at 919 S. Grand Avenue, Los Angeles 90015.